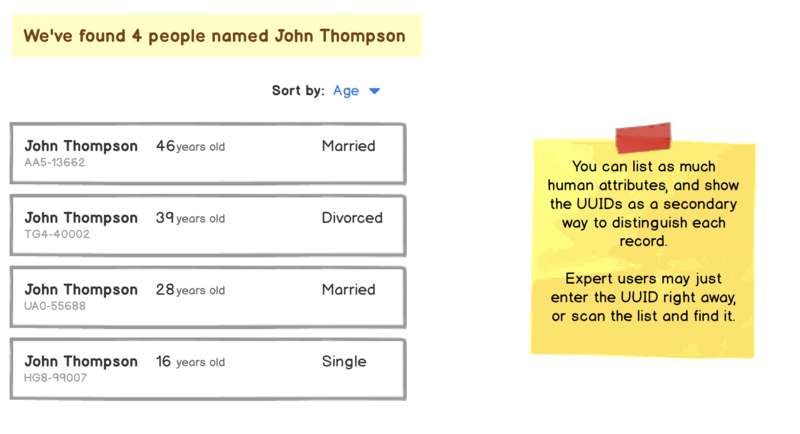 I'm working with a UI where users can create records that represent people. The user enters multiple fields (Name, Age, Married status), but I'm wondering how I should display duplicate data. It could be possible that there are multiple entries with the same data. In this case, does it make sense for me to display the IDs the database generates? Would this help the user differentiate these records? Breno is a new contributor to this site. Take care in asking for clarification, commenting, and answering. Check out our Code of Conduct. Find out the priorities by which people search, and how they differentiate by subsequent queries when they run across duplicate records. Who is searching for this person, and what do they know? If I know a persons name, age and marital status, that could be the beginning of my query. After that, I might look for their location (if given). Or, if the search has no additional data to surface, I will have to look at the detailed history of any activity or operations performed on this record. A database ID is only useful to me once I've established that it represents exactly the person whose record I need to access / perform operations on. In this case we will need to understand how users are sorting the data and which fields are important to them. If they are primarily looking for record id, probably while trying to match the same from somewhere else, then yes it will become a priority feature. If the users are not keen on sorting or searching by the record ID, it will be better to leave them out of the table. As for multiple entries from the same user, i would suggest to group them if possible. Then again, this depends on the user sorting and search behavior. If the users search by name then we should group the activity. If they are mainly concerned with the time of activity then not grouping them would be better to help them scan quickly. Ren is a new contributor to this site. Take care in asking for clarification, commenting, and answering. Check out our Code of Conduct. Breno is a new contributor. Be nice, and check out our Code of Conduct. Not the answer you're looking for? Browse other questions tagged gui-design intuition or ask your own question. How to mark dependent fields while updating rest of the fields?